We sometimes need to think things over before we act. I learned the hard way that, just because someone claims to be spiritually guided, it does not mean they are acting in my best interest. Perhaps you remember the chiropractor that explained that he was opening up the channels for the nerves running through your back in order to get them back to the way the creator meant them to be. 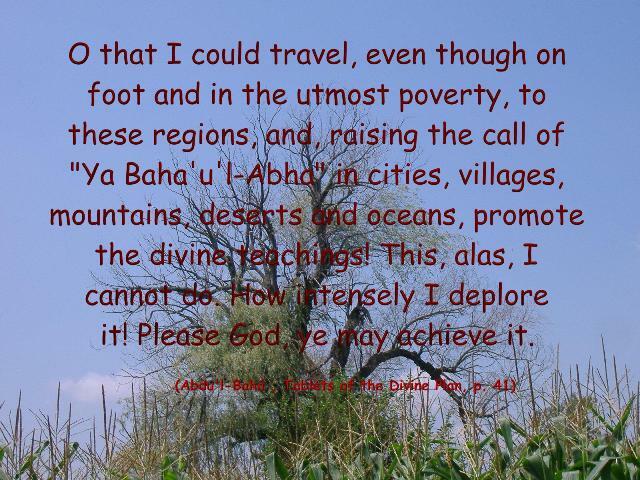 Since, as a Baha’i I accept that science and religion must go hand in hand, I jumped on this philosophy and went about promoting him. Then I went to another meeting where he talked of how all illness could be cured by opening up the channels of communication through the body’s nervous system. Okay, now I’m a little suspicious since I’ve heard a few cure all theories before. He continued on to explain that it did not matter what you put into the body explaining that even people who smoke sometime live to a very old age. It is all about the condition of the back and how the nerve cells are relaying the body’s messages. Now something is not right. This does not seem to be in conformity with science and reason. Surely, with all the scientific knowledge to the contrary, a competent doctor would not promote smoking and lustful eating habits. Still, with my doubts, I continued to talk with him and stupidly allowed him to give me a free adjustment. Ouch! That hurt. Three months later I still have pain and have finally made an appointment to see a medical doctor. To be fair, the chiropractor did offer further adjustments and explained that pain after the first adjustment was normal, but I wasn’t willing to risk it. For three months now, I have been unable to do normal work and sometimes something as simple as lifting my hand to point a finger causes a sharp pain to shoot through my back and stomach area. He may be right and be able to correct it, but reason tells me that, when the pain continues to get worse over three months, something is happening that another whack in the back is unlikely to correct and could very well do more damage. So tonight I will endure another painful night of sleep and tomorrow I will get another opinion, this time from a medical doctor. 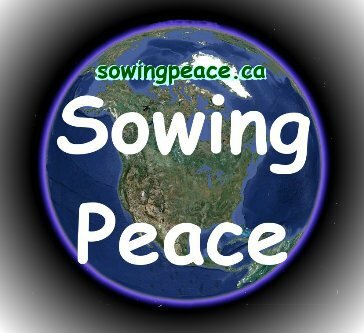 We gather at DR Discount & Wholesale, 639 Nelson St. London, Ontario Every Tuesday at 7:30 PM (store will be closed for the day) for a discussion on peace. If you would like to join us, call 519-850-6651 or email peace@drdiscount.ca for more information. If you have ideas on how we can live peaceably with our fellow word citizens you are welcome to come and share. If you have run into challenges in your struggle to remain at peace you are welcome to share that as well. Perhaps others have had similar experiences and can help to find solutions. This is strictly a sharing forum. No one has the answers, but together we can learn from each other. World peace begins with individuals like you and me. We must be at peace with ourselves and those we come into contact with if we want to see a peaceful world. We want to avoid all prejudice of every sort, whether racial, patriotic, economic or religious, so all are welcome regardless of where one stands. A few days ago, as I was walking to work, I saw a cat approaching in “attack” mode. Claws in the air, it jumped out in front of me and then immediately went into “make a friend” mode. It seems that when he noticed the relative size of his intended victim, friendship seemed like a better idea. As he purred and rubbed up against my legs, I tried to reason with him, but to no avail. It seems trying to reason with a cat is an act of futility. However, he did draw my mind to some facts of nature. When animals are domesticated their instincts remain. In their natural setting, cats needed to hunt for food. Now being fed by humans their hunting is no longer necessary, but the instinct remains so we often see them out chasing birds or other small creatures. So long as you don’t leave a cat alone with your budgie or hamster no real problem occurs. Dogs are another matter. Having worked with a turkey farmer in the past, he told me how pet dogs were the worst menace to his free range turkeys. When recognizing a neighbours pet chasing his turkeys, he would inform the neighbour who claim that it could not have been his dog since it never left his farm. Many times, unknown to the owners, pet dogs join together at night and form hunting packs that may even attack humans. These animals, in nature would kill their food. Now, as pets they do not need to do that, but the killer instinct is still there. This turkey farmer informed me that a wild animal may attack his flock and kill one bird which it would haul away and devour. These pets aren’t hungry, so they attack and kill many birds and leave them there to rot. Now we bring this up one level to humanity. Ancient humanity lived by hunting and gathering. They not only had to kill what they would eat, but had to protect themselves from wild animals that were sizing them up for lunch. In modern society this is no longer necessary; however man does possess the killer instinct. The difference with man is that he has a spiritual side and has reasoning powers that animals don’t possess. When humans develop their spiritual side the desire to kill is abolished and they live peaceably with their own, but animalistic mankind still wants to kill for personal gain or to squelch a perceived threat. It has been said that when a man acts like an animal he becomes lower than the animal. The animal has no reasoning power and acts on instinct through ignorance. When man allows his animal nature to take over, he has reasoning power and can override his instincts, so he knowingly inflicts cruelty on his fellow man and is worse than the ferocious beasts. Agreement of Science and Religion / Spiritual and Physical Healing. Religion and Science are inter-twined with each other and cannot be separated. These are the two wings with which humanity must fly. One wing is not enough. Every religion which does not concern itself with Science is mere tradition, and that is not the essential. Therefore science, education and civilization are most important necessities for the full religious life. Agreement of Science and Religion is one of the basic principles of the Baha’i Faith so when we see its realization outside of the Faith, we are not surprised, but it excites us to see the Divine Plan of God coming together. The powers of the sympathetic nerve are neither entirely physical nor spiritual, but are between the two (systems). The nerve is connected with both. Its phenomena shall be perfect when its spiritual and physical relations are normal. When the material world and the divine world are well co-related, when the hearts become heavenly and the aspirations grow pure and divine, perfect connection shall take place. Then shall this power produce a perfect manifestation. Physical and spiritual diseases will then receive absolute healing. The exposition is brief. Ponder and thou shalt understand the meaning. Although, on account of lack of time, the answer is short, by close reflection it shall be made long. Labels: Agreement of Science and Religion / Spiritual and Physical Healing. Discussion and prayers for peace. If there is only one GOD, why do those who believe in HIM kill each other? London World Peace Forum is a Blog for world Peace. We approach the process of World Peace at a grassroots level where each individual member commits to a non violent life style and attempts to influence at least one other person to do the same each year. This blog is a place where ideas can be exchanged and members can share their successes and struggles in their attempts to influence others. Feel free to leave comments, suggestions and your successes in establishing world peace in your community. Every Tuesday evening at 7:30 pm we gather at my store, DR Discount & Wholesale, 639 Nelson St. London, ON N5Z 1J6 to pray and share ideas. If you wish to join us call 519-850-6651 to confirm you are coming and to be sure that the date or location has not been changed. This week’s question for reflections is, “If there is only one GOD, why do those who believe in HIM kill each other?” We welcome all Faiths, religious persuasions, ethnicities, etc, to join in. I believe when we get to know each other we will learn to trust and respect each other. As Sting said in his hit song Russians; “What will save us, me and you, is if the Russians love their children too.” When we learn that we have common values and all desire to live with peace and security, we will not longer live in fear and hatred. Come back soon for an article on healing and peace.